Every year or so, I realize there are way too many great books out there that I’ve never gotten around to reading. And then I get an itch to soak up the written word. Summer is coming, and while these season is usually a time for “beach” books, this summer I’d like to get prepped for Banned Books Week – this year it’s September 22−28. 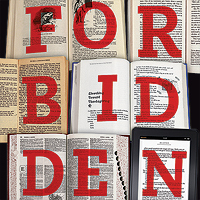 The lists of banned books are distressingly long, every year the American Library Association’s Office for Intellectual Freedom compiles a list of the top ten books that are most frequently challenged in libraries and schools around the country. They also have lists on Frequently Challenged Books of the 21st Century, 100 Most Frequently Challenged Books by Decade – and my favorite – Banned/Challenged Classics. As it turns out, attempts have been made to ban nearly half (at least 46) of the Radcliffe Publishing Course Top 100 Novels of the 20th Century. This entry was posted in Culture Vulture and tagged banned books, books by allymiller. Bookmark the permalink.